I was wondering if it would be possible to make rating the shipping as optional for customers. We have a brick and mortar store as well as an online store and people often come pick up their stuff in store and they are wondering what to do with the shipping rating. @datakick Thanks for the reply! That's what I also first thought, but I have as a delivery delay 4 days and orders that are 22 days old but still show the message that merchandise hasn't been delivered yet. My guess is that your Shipped status does not mark order as delivered. You will either need to fix this status, or change your workflow to switch order status to some other Delivered status few days after shipment. I changed the status settings, but the old orders on the status don't update to reflect this. Is there a way to update them? I changed the status settings, but the old orders on the status don’t update to reflect this. Is there a way to update them? Delivery day value in revws module was the quickest way. I'd tried that, but the first time it didn't work, oddly. Now it did. Also i wrote earlier that not all string resources could be translated because are palced in the .js file. So the question is - do you plan to sort out this? yes, it is correct. It's a placeholder for inserting a line-break. yes, it is correct. It’s a placeholder for inserting a line-break. Yet another version of this module is out. I love this review module except that I don't have a way to hook it on the product page below the main product name as desired. I know it's possible through template mods I'm sure, I'm just not savy enough to do that. It's the only thing keeping me from using it. @x97wehner that's actually much more complicated than I thought. 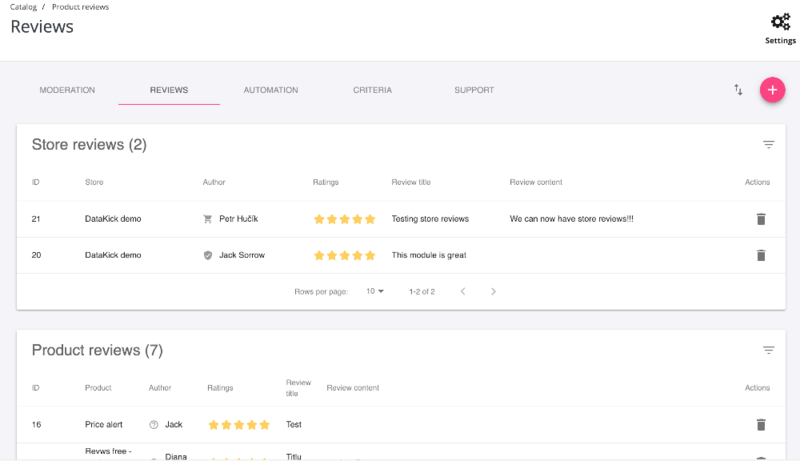 Review average is rendered using either displayRightColumnProduct or displayProductButton hooks -- what hook will be used can be selected in module settings page. It's possible to edit your product.tpl template and move one of these hooks to the appropriate place. For example, move this line. The problem with this approach is that these hooks are shared -- many modules can, and usually do, use them to display additional information on product page. So, if you move placement of this hook within template, you will be moving content generated by other modules as well. In other words - you can use this approach only if no other module is using this hook -- you can check in Modules > Positions. For example, in my case, if I move displayProductButtons hook it will affect Block Product Payment Logos module as well. I will add a new dedicated hook to the module for this particular use case. That way, you will be able to call this hook anywhere in the product template, and it will not impact other modules. wait! I didn't "mess" with templates so much but I always thought that was possible to add a hook from TB/PS backend, and then attach to it what module view you want... it has to be done the other way around instead?! wait! I didn’t “mess” with templates so much but I always thought that was possible to add a hook from TB/PS backend, and then attach to it what module view you want… it has to be done the other way around instead?! Well, you can surely create a new hook, and transplant existing module's hook to that one. But that won't help you in any way, because this new hook will not be triggered by your theme (unless you have one of those fancy themes that let you to choose what hooks to display where). @datakick Yes, I had attempted this previously and encountered the same result. Please advise when the new dedicated hook is added and I will attempt to use. The rest of the module is spectacular. I've released a new premium version of revws module. Upgrade 2.0.4 brings one of the feature everyone asked me about - Store Reviews. You can check this new functionality on my demo account - front office / back office. If you don't need this feature, free version is still there and fully supported. Really........ I'll have to investigate this today I think. Thanks again! 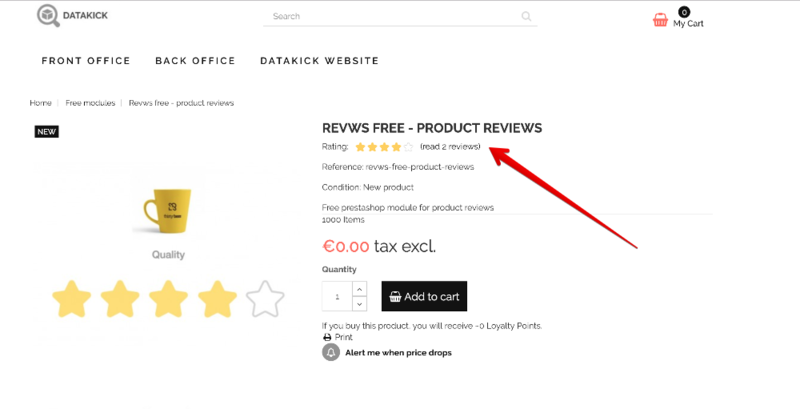 Probably a dumb question, but where is the option to import reviews from the default product comments module? I can't find it anymore in the menus.